My parents, Carolyn and Larry, taught me compassion and persistence. Many of you met my Dad and Mom when they campaigned for me in 2015. I'm pleased to report that they are coming back to Alexandria to join us at my home this Saturday at 7:30 pm for Fireworks on the Potomac, my riverfront fundraiser. You are cordially invited to attend. Proceeds go to elect Democrats to the House of Delegates. Get your tickets here or RSVP on our Facebook event page now. The annual raucous party that no one wants to miss is at my townhouse at 805 Rivergate Place in North Old Town on Saturday, July 7 from 7:30-10:30 pm. Come eat, drink, be merry, and watch Alexandria's birthday fireworks from my back porch and the hillside which borders Rivergate Park on the Potomac River. Note the date: It's next Saturday, July 7. Not Wednesday, July 4. Fireworks begin at 9:30 pm. But experience has shown that if you don't make it to my house by 8 pm, traffic is heavy and parking is even more difficult. So please make sure you come by 8 pm to get a good lawn seat. Or you are welcome to come later after the festivities next door at Oronoco Park. Cheap and easy ways to park are found here. Otherwise, it is usually quite difficult. There will also be a wide variety of after-dinner hors d'oeuvres, including Dave's famous meatballs and lots of vegetarian, vegan, and Kosher options. So please don't bring food. We are a nation of immigrants. It is un-American to deny due process or basic human rights to those who come here seeking asylum as my ancestors did and, quite probably, yours did as well. I joined tens of thousands of Americans yesterday at the White House to protest this institutionalized child abuse by our Government. We had a good crowd of caring, concerned people. I also joined my Democratic colleagues in the House of Delegates in urging Virginia's Members of Congress to call on the Trump administration to end the unjust separation of immigrant families. Read our letter to the Virginia congressional delegation here. In Virginia and throughout the nation, the Republican Party has long believed that the best path to electoral victory is to pack a large amount of African-Americans in a few electoral districts so as to decrease their influence statewide. This week, the Fourth Circuit Court of Appeals threw out Republican racial gerrymandering in the Virginia House of Delegates and ordered at least 11 Districts to be redrawn in time for the 2019 Elections. 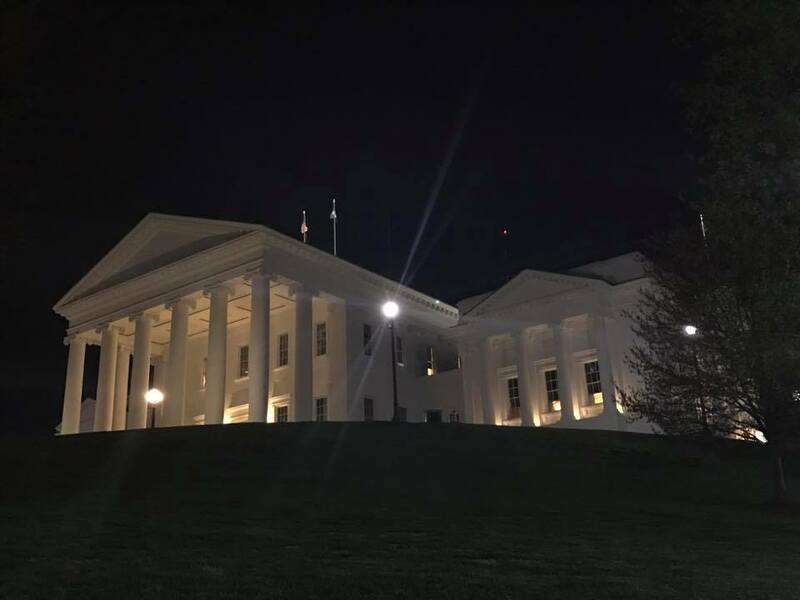 You can read the full 188-page opinion and dissent here.This means that Virginians might soon have a real and fair say in choosing who represents them in the House of Delegates where I sit! This is exciting and could change the boundary lines of 20-25 districts in the Richmond area and southeast Virginia. In 2017, more than 1.3 million Virginians chose Democrats to represent them in the House of Delegates, while only about 1.075 million chose Republicans. Despite our landslide victory of more than 21%, this racial gerrymandering was a factor in the Republicans maintaining a slim 51-49 control over the chamber. Although the court decision won't affect political gerrymandering or partisan judicial decisions by Republican judges (other factors leading to the undemocratic control by Virginia's minority Republican Party), it surely will help us maintain and add seats in 2019. 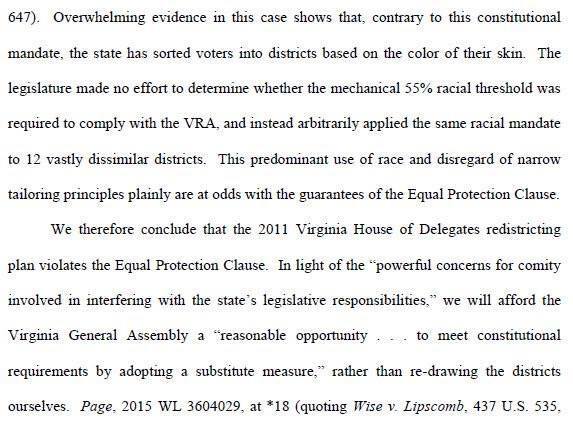 Excerpt from Bethune-Hill v. Virginia State Board of Elections. Congratulations to the winners of Virginia's primary elections on Tuesday, June 12. 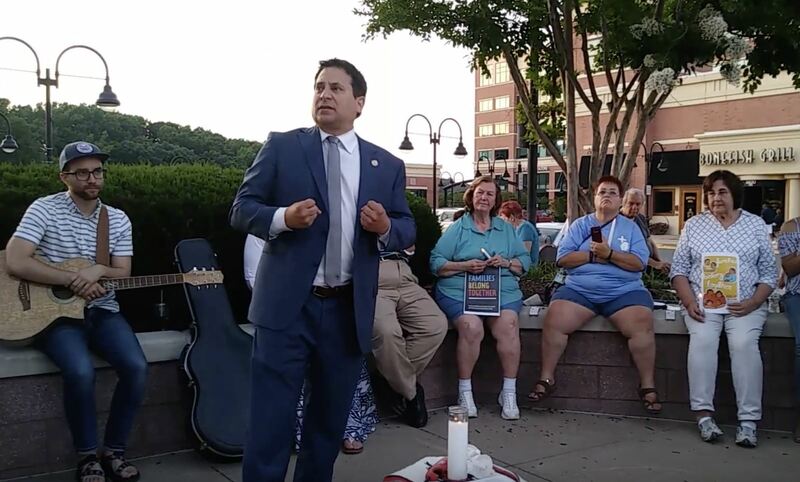 In Alexandria, Democrats nominated Vice Mayor Justin Wilson for mayor, chose Del Pepper and John Chapman for re-election, and picked Canek Aguirre, Elizabeth Bennett-Parker, Amy Jackson, and Mo Seifeldein to join the three returning members. This means the majority of the Council will be new members next year. I strongly endorse all seven Democrats to be elected in November 2018. I also want to send a big thank you to outgoing Mayor Allison Silberberg and City Councilmen Willie Bailey, Paul Smedberg, and Tim Lovain for their long and dedicated service to the City of Alexandria. They will remain in office until January 2019, and I know they will continue to serve our city in ways large and small. 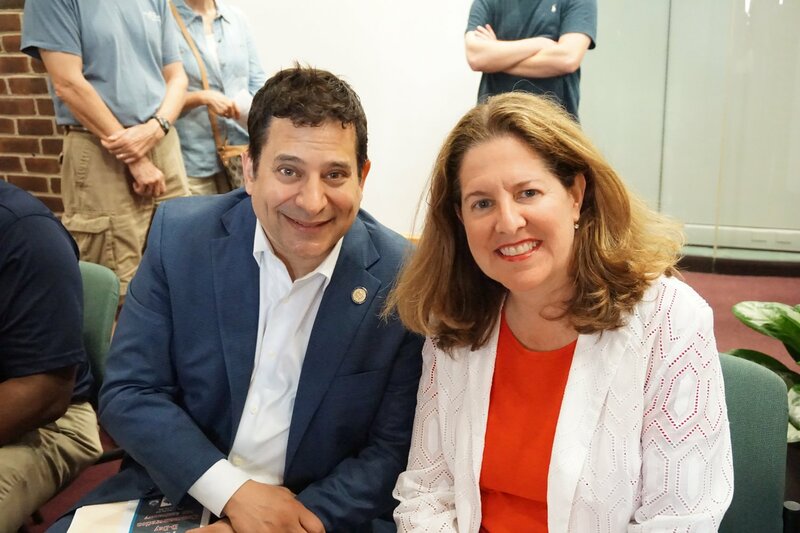 In Arlington, congratulations are in order to Matt de Ferranti for earning the Democratic nomination for Arlington County Board. 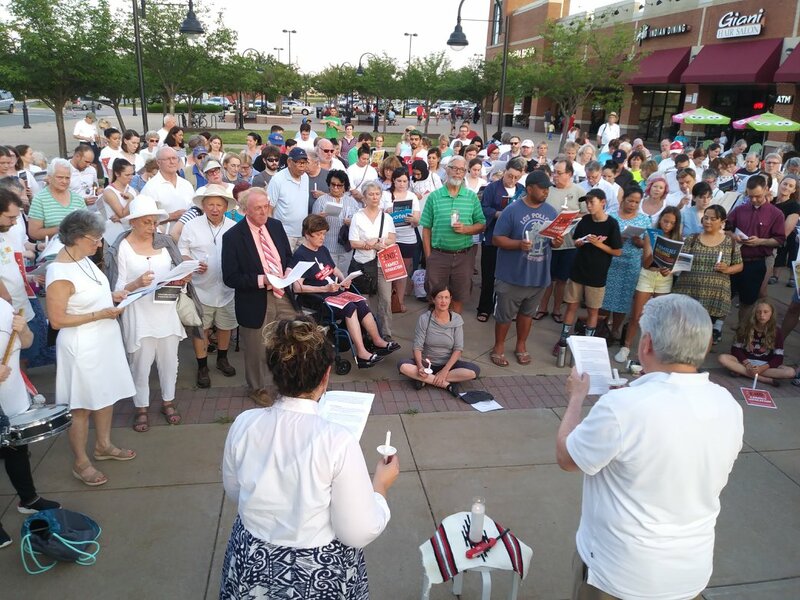 Unlike the Democratic nominees in Alexandria, he is likely to have a competitive general election in November, running against incumbent John Vihstadt for a seat on the Arlington County Board. I heartily endorse Matt and encourage Arlington folks to vote for him this November. Steven Marku, my Chief of Staff who has been an indispensable help to me for three sessions as State Delegate, is moving on to a new position. I can't thank Steve enough for his dedication to serving the 45th District, and I wish him well in whatever he decides to do in the future. 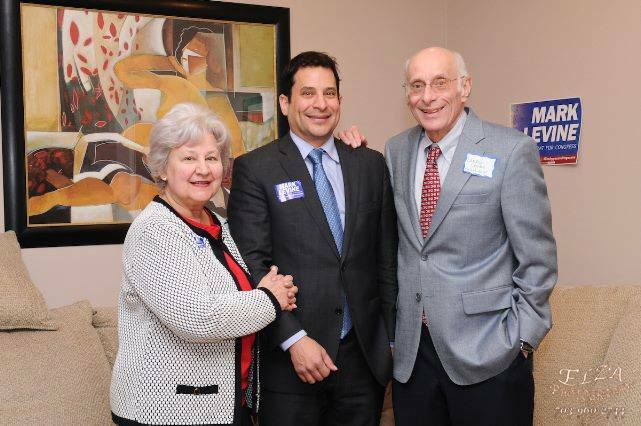 Filling Steve's formidable shoes is Jacob Weinberg, who, many of you will recall, managed my campaign for Delegate in 2015. Jake is an experienced grassroots organizer who grew up in Fairfax. He most recently served as the Policy Manager for the Tennessee Immigrant and Refugee Rights Coalition, and I look forward to tapping into his knowledge of immigration policy as we work to make Virginia a more welcoming and safe state for all immigrants. Jake, like Steve, is hard-working and smart. So while I expect it will take him a bit of time to learn his new responsibilities (be gentle with him during the transition! ), I'm confident that he will soon take a good hold of the reins and do an excellent job. You can meet Jake and say goodbye to Steve at my July 7th fundraiser. Feel free to contact him anytime at Jacob@MarkforDelegate.com and welcome him back to Northern Virginia. After the Parkland shooting, I suggested that the House of Delegates hold a series of town halls throughout the Commonwealth this summer to discuss ways to reduce gun violence. So far, the entire House Democratic Caucus (but no Republicans yet) have taken me up on my suggestion. We are calling it the Safe Virginia Initiative. 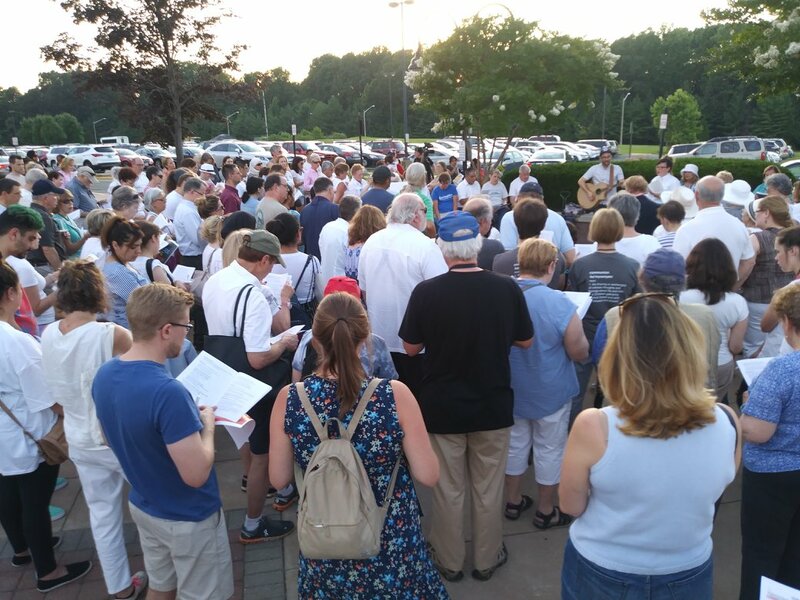 Our first town hall in Northern Virginia will be held this Thursday, July 5 at 6 pm at the ADAMS Center, a mosque located at 46903 Sugarland Road in Sterling. Please join us to offer more than thoughts and prayers. 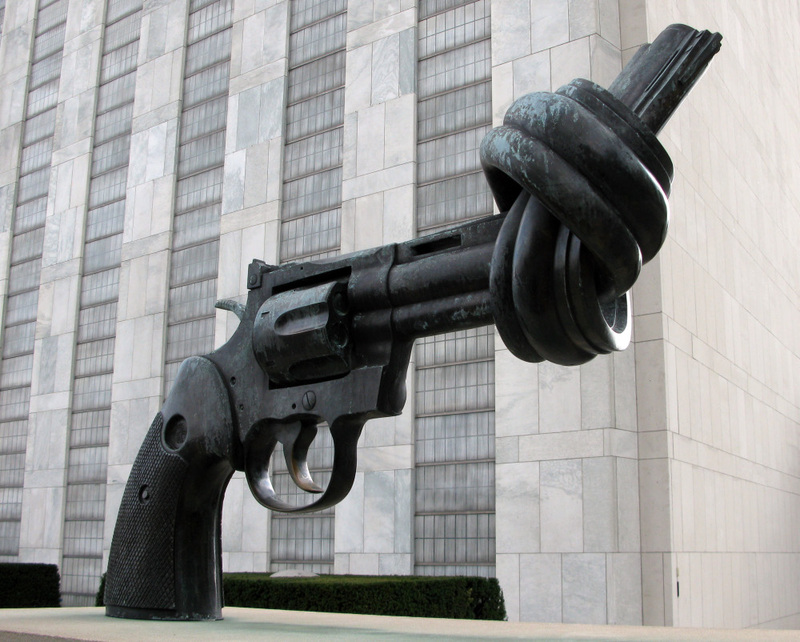 We aim to discuss meaningful efforts and necessary legislation to sharply reduce gun violence in Virginia and nationwide. 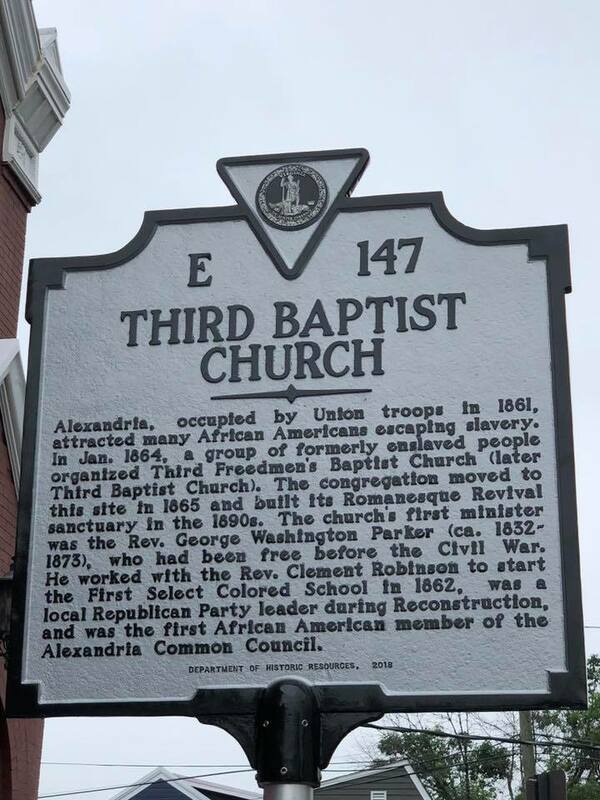 This past General Assembly session, I patroned the successful House Resolution 572, which honors the important place that Third Baptist Church holds in the history of our community, state, and nation. 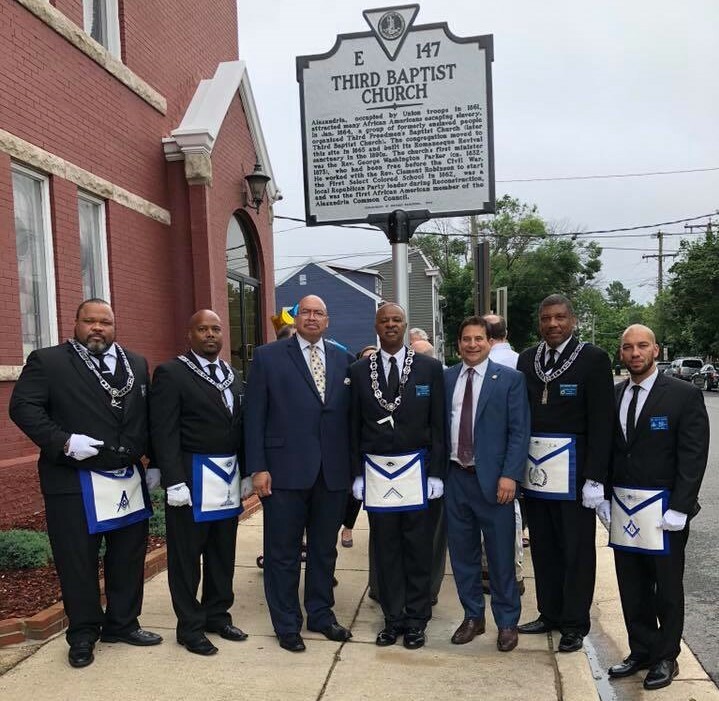 I was honored to present the General Assembly's commendation to the church on Saturday, June 23, speak there, and take part in the unveiling of their new historical marker. Congratulations T.C. Williams Class of 2018! T.C. 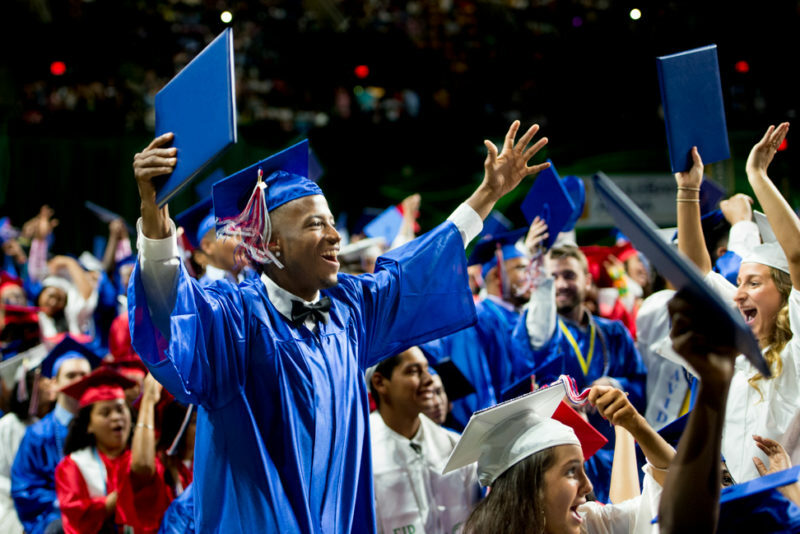 Williams High School celebrated the graduation of 793 students on June 16. The class of 2018 is the largest group of graduating students in T.C. Williams' recent history, and they also have the largest number of students from a single class heading to college ― a 58 percent increase on last year. Congratulations, graduates! While Alexandria City Public Schools (ACPS) are out for summer, ACPS will continue to offer free summer meals for youth 18 and younger at various recreation centers and schools throughout the City of Alexandria. Go to www.acps.k12.va.us/summerfood to learn more. And if you miss July, there's always August or September. Every month, I make sure to be available in this informal setting for any constituent who wishes to discuss a concern or just say hello. At D.C. 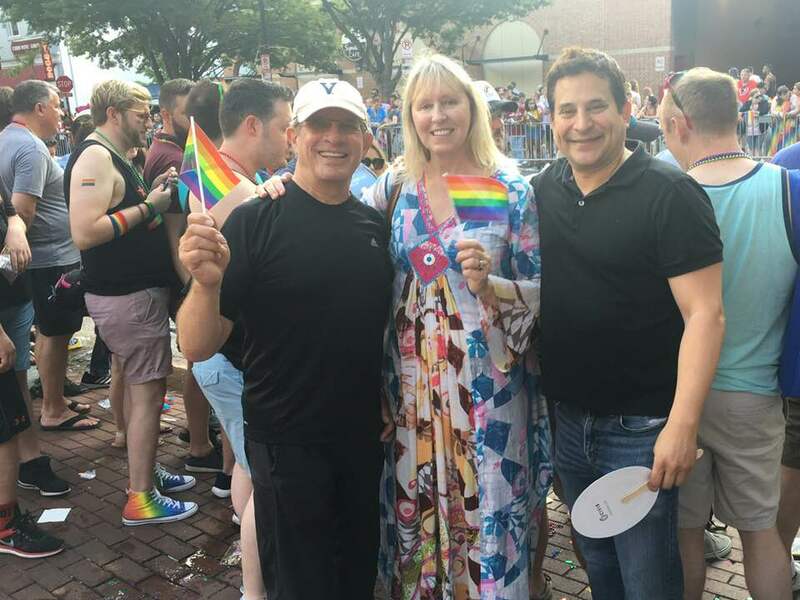 Pride with constituents Kathleen and Julian Joshua. At Alexandria's D-Day 74th Anniversary commemoration with Mayor Allison Silberberg. At the signing of HB1087, which prohibits animal testing where alternatives exist. 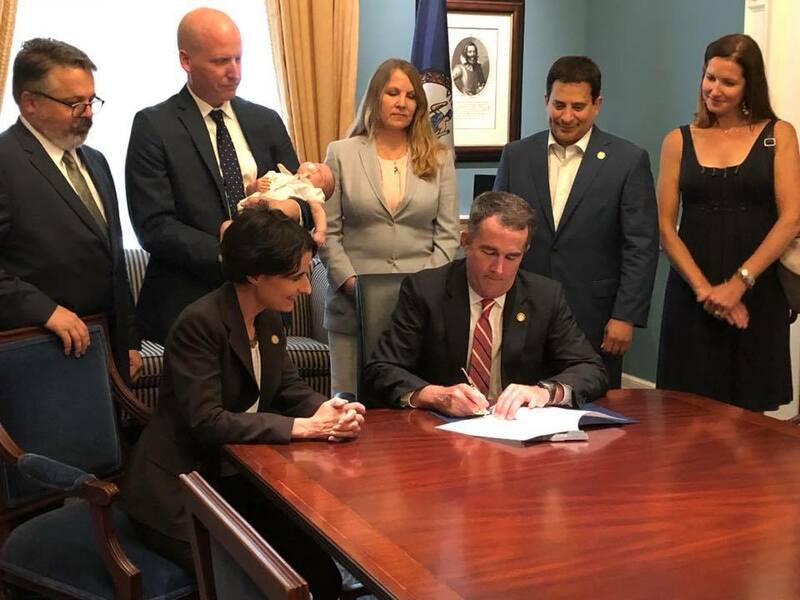 Virginia is only the fourth state in the nation to adopt such restrictions on animal testing. I was a co-patron of Delegate Jennifer Boysko's terrific bill. 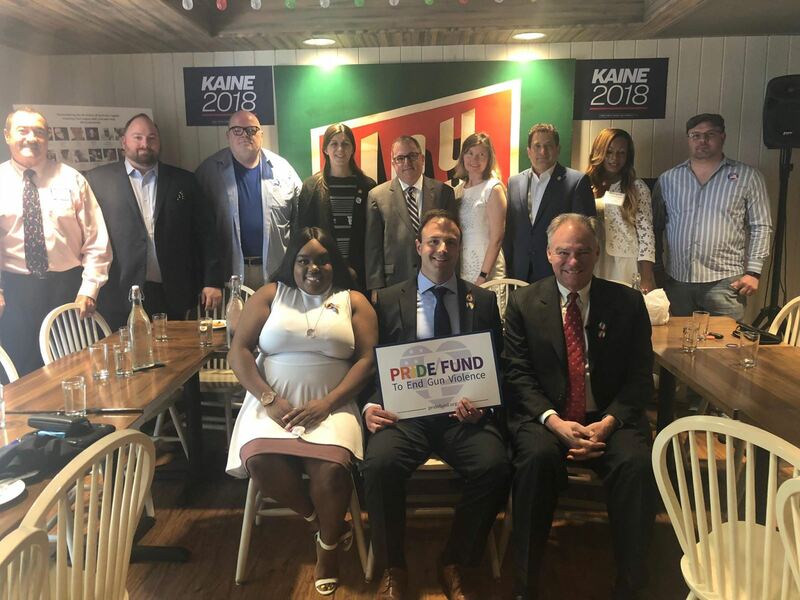 At Senator Tim Kaine's rainbow roundtable discussion on gun violence during Pride. Upcoming Events - Please Join Me!